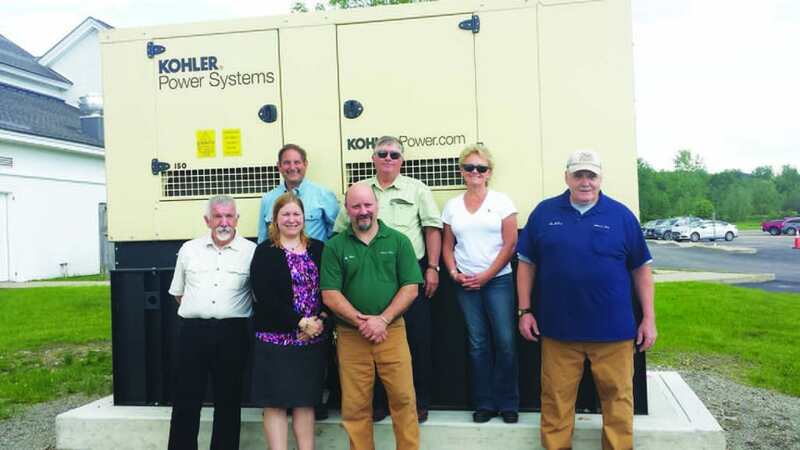 Morlino explained that the 20-kilowatt Kohler Power diesel generator was made possible by a $48,000 FEMA Hazard Mitigation grant to the town of Pawlet, along with $16,000 in private matching donations. With this new feature, the town will be able to use the school as an overnight shelter for Pawlet residents and anyone in the surrounding communities. The generator also means that Pawlet will be able to locate its emergency operations center (EOC) at the school for use in town-wide emergencies. A second grant of $6,800 has more recently been awarded to the town of Pawlet for radio equipment to be used by the EOC. The radios will be installed in September. Both Morlino and DeBonis emphasized the community-wide scope of this project and thanked everyone who had participated — the many private donors and the volunteers for major fundraising efforts at Consider Bardwell Farm, the Pawlet Station Restaurant, the Duane Carleton music event held at the school, and the fourth-grade flower bulb sale. Also recognized were members of the school staff, including teacher Dawn Robertson and custodians Bill Wood and Jim McGraw. Others who participated in this effort were the local contractors some who generously gave reduced rates for their time and materials — Matt Waite Excavation, Tyler Electric Security, and Jim Sheldon Excavating, as well as many individual volunteers in the Pawlet community. Morlino explained that after Tropical Storm Irene in 2011, when many parts of Pawlet were isolated by flooding, the town recognized the need for an additional overnight shelter site. The school is ideally situated for this purpose. Pictured front row left to right are Jay Luebke, Brooke DeBonis and Bill Wood. Back, left to right are Bob Morlino, Ed Cleveland and Kellie Waite.